My old Jiffy ice auger coughed, wheezed and finally sputtered to life like an asthmatic struggling for a last strained breath at a dust mite convention. Loaded with last year’s “un-stabilized” ethanol fuel and operating in an ambient temperatures just above freezing, the poor old girl’s carburetor strained to maintain a healthy purr. Despite her initial complaints, the beast to tore four impressive ten inch holes through the ice and in the process, just about rattle every filling out of my skull. Then suddenly and quite unexpectedly something inside the machine made a loud “clank”, the motor whined, bucked and then died. A quiet calm settled onto the lake, as the last echoes of the augers final belches of exhaust spewed out of its muffler. This incident marked for me the end of an era, a final goodbye salute to an old friend. It also proved to be the last time I ever picked up a gasoline powered ice auger. Years ago, I would have scoffed at the prospects of an “electric” powered ice auger but the Ion Electric Ice Auger is an amazing piece of equipment. Powerful, fast and QUIET, the 8 inch ION will drill up to 40 holes through 2 feet of ice on a single charge. At just 22 pounds, the ION is just shy of half the weight of my old gas powered ice auger and boasts special blades that create smooth breakthroughs and no jarring stops. Add the ION’s ability to reverse its blade and flush slush down the hole and it’s blatantly obvious that this auger should be on every anglers most wanted list. I purchased my ION about 4 years ago and since that time, the company has continued to make numerous updates and changes to the original ION to make it even more effective in cutting ice. The newest addition to the ION line-up is the ION X, 40-Volt High-Performance Auger. This new ION auger boasts numerous improvements including the ability to drill through almost double the amount of ice as the older models. It also has a center point blade, like the old Jiffy’s that makes pin point blade positioning possible. Also, integrated LED lights for drilling in low-light situations and an new trigger and handle design make it even easier to operate than the original. Even with all of these ergonomic and performance upgrades, the ION still weighs a mere 22 pounds. When you can hand your auger to your 11 year old son and have him safely drill all of the ice holes, you realize that the initial investment is well worth the money. Another investment I made last year, in my ice cutting arsenal, was a new ice chisel. Now a sane person might wonder why an individual with a power ice auger would also need an ice chisel but be assured there was a need. My previous spud, was a relic used by my grandfather that was basically a long iron pipe that had one end flattened with a hammer and had then been sharpened with a file. While it would eventually hack through the ice, I always felt using this “tool” to bludgeon my way through the hard water was likely a task that could be vastly improved upon. The Eskimo Redneck Ice Chisel is truly the lamborghini of ice chisels. While I would not use it to hack my way through 3 feet of ice, it is a fantastic tool for easily chopping out day old holes previously fished by yourself or other fishermen. Also, if like me you enjoy trapping your own live bait, the chisel is indispensable in keeping the holes open and clear of ice. Properly outfitted with the latest in ice fishing gear, anglers this month would be well served to begin chasing brook trout on many of the stocked ponds in Central Maine. In historical alignment with previous yearly stocking reports, Togus pond (Delorme’s The Maine Atlas and Gazetteer (MAG), Map 13 C-2) in Augusta was stocked with approximately 1,000 brook trout in the 12-13 inch range during the month of November. While Togus receives heavy fishing action, good fishing exists on this 676 acre pond right through early spring. In addition to brook trout, the pond also contains a healthy population of delectable white and yellow perch and largemouth bass of the size that will turn heads. Access to the pond is available off route 105, approximately 5 miles outside of Augusta. Parking is limited along the road as well as at a small parking lot next to the bridge. Since the access is at the extreme southern end of the lake, on windy days there is very little protection. Many anglers bring small portable shelters or haul in via snowmachine large, comfortable ice shacks complete with wood fueled heaters. If anglers are looking for lots of popping flags, Little Togus Pond (Map 13, C-2) offers explosive action for largemouth bass, pickerel and yellow perch. Anglers should just make sure that they walk at least half way across the pond before drilling holes as the pond is extremely shallow. Again, as with Togus Pond, out in the middle of the lake there is very little shelter from the wind so plan accordingly. 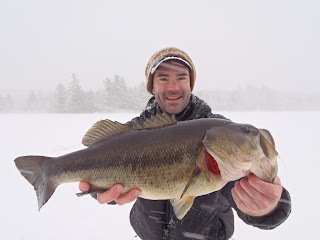 When I fish big and little Togus with my children, I wait for calm and sunny days or bring my small portable ice shack and little buddy heater. Having them warm and comfortable means they enjoy the experience and I get to spend more time fishing!